Our design team work hard to create spacious and contemporary floorplans – and we’d love for you to become a little more familiar with them. In today’s blog, we welcome you to learn more about one of our comfortable, tranquil and elegant designs – the Newport III. Perfectly sized just over 24sq, Aston Homes’ Newport III is an elegant and comfortable home, featuring four bedrooms, two living areas, two bathrooms, a double-garage and versatile alfresco. Entering the Newport III via the porch, you are greeted by an impressive master bedroom. The adjoining ensuite features an oversized shower with tiled base, double vanity with stone bench top, chrome tapware and a separate toilet. The master bedroom is beautifully finished and intentionally positioned at the front of the home away from the rest of the sleeping quarters – promoting privacy and tranquility. As you journey down the hallway, you have the home theatre to your right and the light-filled open plan living, dining and kitchen zone located to your left. The spacing of these two areas suggests that this is the epicenter of the home. The theatre room is well positioned for enjoyment, encouraging the kids to settle in for a movie night while the grown-ups entertain in the living zone – easily checking in from time to time! The three additional bedrooms are positioned at the rear of the home and are all complete with walk in robes and easy access to the sparkling central bathroom and separate toilet. Whether these bedrooms are used for children, visiting family members or friends, they are ideal for living and entertaining! The home is equipped with a spacious laundry with external access and the living area immediately leads to the decked alfresco, which can be enjoyed all year round – autumn weekend barbeques, sunny summer brunches and holiday happy hours are on the way! Stone bench tops throughout, including the laundry. 900mm kitchen appliances & stainless steel dishwasher. Ducted heating and evaporative cooling. TV antenna, multiple data & tv points installed. Flyscreens on all operable windows. 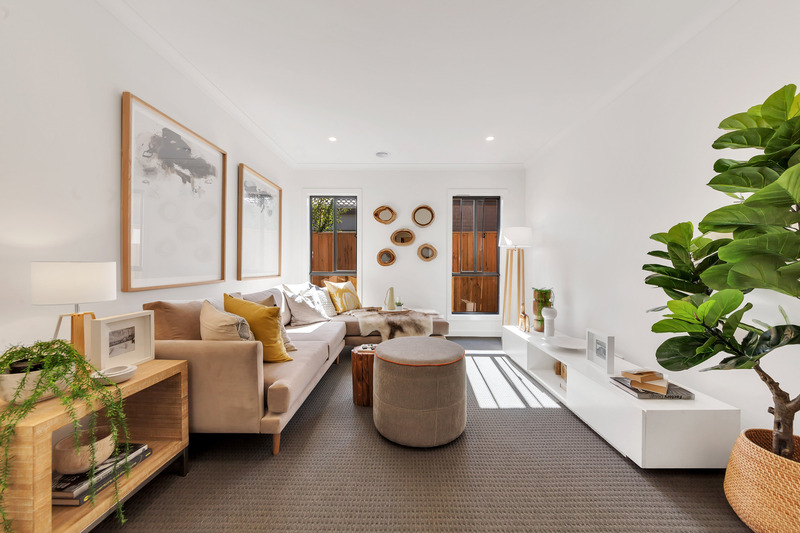 We would be delighted to offer you a personal tour of the Newport III design at our display homes in Aurora Estate, Epping. Our doors are open from 11AM to 5PM daily. For more information or to book in a time for your tour, please contact our sales team, or check out our facades and floorplans here.